No one wants it! No one likes it! Yet, it's always around! So how do you get rid of it? Well the first thing to do is Understand It! Visceral fat (which gets its name from viscera, which refers to the internal organs in the abdomen) resides deep within the torso, wrapping itself around your heart, liver, and other major organs. In fact, it's possible to be relatively thin and still have too much visceral fat. That's why it's sometimes referred to as "hidden" belly fat, but we prefer to think of it as "deadly." Excess visceral fat can literally subtract years from your life. The proximity of visceral fat to your liver boosts production of LDL cholesterol (the "bad" one), which collects in your arteries and forms plaque, a waxy substance. Over time, this waxy plaque becomes inflamed, causing swelling that narrows the arteries, restricting the passage of blood. The narrowing passageways increase blood pressure, straining your heart and potentially damaging tiny capillaries. The inflammation further increases your risk of blood clots, which can break loose and cause stroke. But it gets worse. Visceral fat also contributes to insulin resistance, an early precursor to diabetes. Insulin resistance is a condition in which cells do not respond to insulin and the pancreas is forced to increase production in order to clear the bloodstream of glucose. Over time, insulin resistance can lead to full-blown diabetes, which can severely comprise the entire circulatory system and cause long-term issues with vision, memory, and wound healing. Subcutaneous is best defined as the fat that you can see, the "inch you can pinch." Subcutaneous means "beneath" (sub) "the skin" (cutaneous), and it's no secret that this fat resides all over. In some places—your thighs, underarms, belly—it may be thicker than in others, but for the most part it's everywhere, even on the soles of your feet. White fat is much more plentiful than brown, experts agree. The job of white fat is to store energy and produce hormones that are then secreted into the bloodstream. Its cells contain a single large fat droplet, which forces the nucleus to be squeezed into a thin rim at the periphery. They have receptors for insulin, growth hormones, norepinephrine, and glucocorticoids. Small fat cells produce a "good guy" hormone called adiponectin, which makes the liver and muscles sensitive to the hormone insulin, in the process making us less susceptible to diabetes and heart disease. White adipose tissue also acts as a thermal insulator, helping to maintain body temperature. The hormone leptin is primarily manufactured in the adipocytes of white adipose tissue. Brown fat has gotten a lot of buzz recently, with the discovery that it's not the mostly worthless fat scientists had thought. Brown fat is now thought to be more like muscle than like white fat. When activated, brown fat burns white fat. Brown adipocytes contain numerous smaller droplets and a much higher number of (iron-containing) mitochondria, which make it brown. Brown fat also contains more capillaries than white fat, since it has a greater need for oxygen than most tissues. It's known that children have more brown fat than adults, and it's what helps them keep warm. Brown fat stores decline in adults but still help with warmth and when stimulated it can burn calories. Body fat distribution differs from person to person. Many people compare subcutaneous fat to the layers of an onion, so rather than disappearing from a particular place, it comes off layer by layer from the whole body. Moreover, the way fat is shed is different from person to person. It tends to go from the most recent place it appeared. If your tummy started gaining first - this will be the very last place for the fat to disappear from. Even if you reduce calories and exercise regularly, you can still be left with too much hidden visceral fat. So what is the answer? 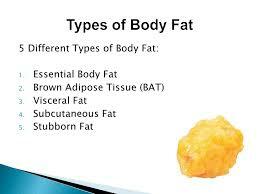 The only way to minimize both visceral and subcutaneous fat is by eating the right kind of ...fat. Studies have shown that a core group of healthy fats—monounsaturated fats that we call MUFAs (pronounced moo-fah), are the key to shedding both subcutaneous and the deadly visceral fat. Other sources include avocados, peanut butter, and many nuts and seeds. Learn More at the links below!